Advent is not the kind of term you’ll ordinarily find in a legal dictionary. Or in a genealogical dictionary either. But it’s a word that’s going into The Legal Genealogist‘s vocabulary, starting tomorrow. Tomorrow — Sunday, November 27 — is the start of the usual Advent season leading up to the Christmas holiday, and thanks to my friend and colleague Helen Smith of Australia, Advent this year is going to be a whole lot different around The Legal Genealogist‘s household. These are the things I’m going to do over the next four weeks as payback to the genealogical community. 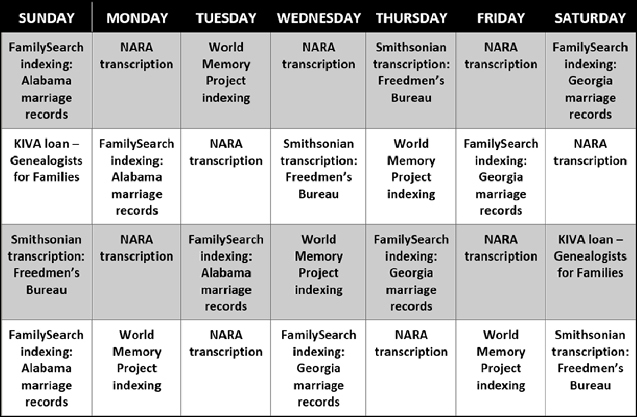 • FamilySearch indexing –Indexing projects in Alabama and Georgia can help find my own families or those in my families’ FAN clubs: friends, associates and neighbors whose lives may have intersected with those of my kin. The indexing can be done by anyone with a computer and a few minutes of time. There are FamilySearch indexing projects available all over the world, and anyone who can read another language is especially needed. You can get more information at the indexing page at the FamilySearch website. • NARA transcription: The National Archives of the United States has many many documents that need to be transcribed for the benefit of researchers everywhere. The Citizen Archivist program is open to anyone with a computer and some time, and there are specific projects for those interested in Native American records, in African American history, in the space program and more. Find out more at the Citizen Archivist page at the NARA website. • World Memory Project indexing: The United States Holocaust Memorial Museum and Ancestry have created the World Memory Project to allow anyone, anywhere, to help build the largest free online resource for information about victims and survivors of the Holocaust and Nazi persecution during World War II. Anyone with a computer and a few minutes can help families discover what happened to their loved ones and restore the identities of people the Nazis tried to erase from history. Find out more at the World Memory Project website. • Smithsonian transcription: The Smithsonian through its Digital Volunteers program is trying to get many of its most interesting and useful documents transcribed for use by researchers. Projects vary widely so there’s bound to be something you’re interested in. Check out the Civil War era collection for example, or the Freedmen’s Bureau records. Find out more at the Digital Volunteer page at the Smithsonian website. And there’s one that’s near and dear to Helen’s heart and now to mine as well. Many members of the genealogical community participate in the Genealogists for Families Project at Kiva — making small micro-loans to people around the world to help them help themselves. Joining with others, these loans enable people without access to banks, especially women, to expand their small businesses so they can educate their children, save for the future and raise themselves out of poverty. Helen explains: “Currently there are 324 genealogist members from all over the world who since 2011 have made over 7792 loans totaling $205, 000. Each loan by an individual is $25 (the loan amount for a project varies) and then the person pays back the loan which allows you to relend that money again and again.” So as of this year, I’m in. You can get more info here on the Genealogists for Families Project page. I had no idea some of these organizations had projects for volunteers! I love this idea Judy. Thank you for sharing. Kudos to Helen for the original idea! Ancestry won’t allow me to participate in the World Memory Project unless I buy a subscription. If I told you what I think of Ancestry you wouldn’t allow it on your blog… so a heads up to anyone else – the World memory Project requires a paid subscription to Ancestry. Not so: you have to sign up for a FREE account yes, but not a paid subscription. I want to thank you in advance for transcribing Georgia and Alabama marriage records. How do you find the time? You are amazing! Paul, it’s just indexing for the Alabama and Georgia records — and remember where my own ancestors are from! We can all find 15-20 minutes for a batch of indexing. There will be others as well, I hope! Myself included before the weekend is out. I would love to post a link to this on my facebook page but it says I cannot. I have signed up for some Irish gravestone transcriptions.